Over the past year, we’ve collected feedback from thousands of ABCmouse teachers about what’s working and what could be improved in ABCmouse for Teachers and ABCmouse for Schools. We’ve used that input to develop and test prototypes of a new user experience, and today we’re excited to announce the launch of a reimagined teacher experience for back-to-school. When teachers log into their ABCmouse accounts for the new school year they will be greeted by a new interface that makes ABCmouse more powerful and even easier to use in the classroom. 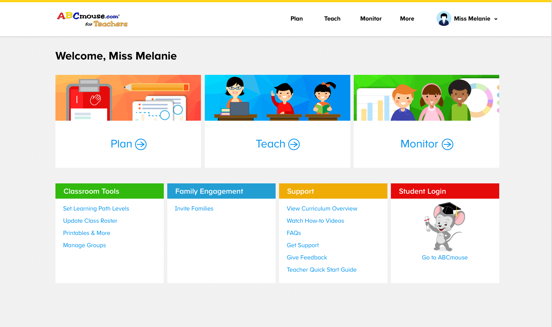 Centered on three core functions—Plan, Teach, and Monitor—this ABCmouse teacher experience enables educators to quickly roster students, find and assign standards-aligned learning activities and playlists, communicate with families, and monitor student progress. See a full list of our new back-to-school features and capabilities for teachers and schools here.